These cookies are so versatile, you can ice them together or dip them in chocolate or simply toss them in castor sugar. My friend Sharlene gave me some glitter gels so I decided to have some fun! 300g flour, 150g castor sugar, 250g soft butter, 1 egg yolk, 1/2 teaspoon salt, 11/2 teaspoon vanilla essence, 1/2 teaspoon almond essence. Beat together butter and sugar until light and fluffy. Add the egg yolk and essence and beat in. Add the sifted flour and salt to form a soft dough. Wrap the dough in cling film and place in the fridge for 40 minutes. Then roll out to the desired thickness and cut out shapes. Place on a greased tray and bake at 180degrees celsius for 12 to 20 minutes depending on how thick the cookies are. Cool completely. I chose to cover the cookies with glace' icing. Sift 2 cups of icing sugar into a bowl. Add a drop of almond essence and add a tablespoon of water at a time and mix well with a fork. The icing should be thick enough to sit on the cookie without running off. 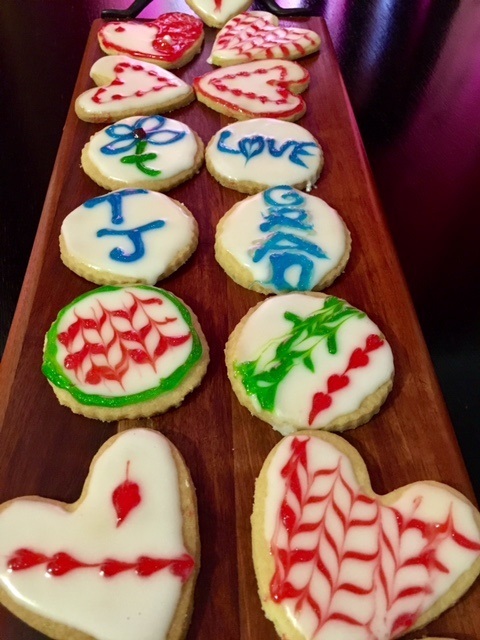 I used the glitter gel to decorate the cookies. Enjoy!